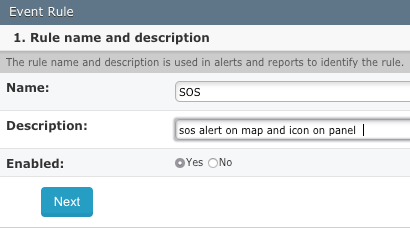 In this guide we will show how to create an Event Rule that generates an alert on screen and SMS when an SOS signal is detected. - To have an SOS compatible device, and the SOS input mapped in the Device Mapper. - To have Operator user types with Phone numbers on their user properties. - If you own your server, to have SMS provider properly setup in your server (not necessary if you have a GpsGate hosted server). At this stage, the event rule wizard starts. It will guide you through the 6 steps to create a rule. 1.1 Input a Name for your event rule. A description is recommended. Keep the rule Enabled if you want it to be active. 2.1 Select your user tag. 3.1 Select Always active if you want your rule be active at all times. This is the most important part of the Event Rules. The expression is the condition/s that trigger the event. Show advanced options allows you to select different inputs to end your event. It's not necessary to be used with the opposite conditions to end an expression. If you use this option, use it with a different input (for example, if you want to end and SOS event when Speed > 0). Immediate/Delayed event allows you to choose when the event will be triggered after the expression is true. In this example we will use SMS as a notification type. Click in the button to add a new notification type. 5.2 Add a Receipients to the notification. 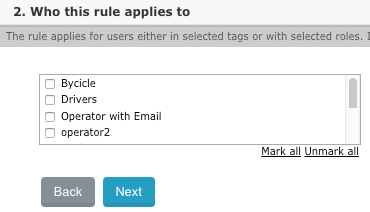 Remember selecting tags that contain users with phone numbers in it! 5.3 As a Message you can customize your own SMS message with your own variables by inserting Variables. 6.1 Select Show in map view should be enabled if you want to display a a blinking icon of the map for the event. 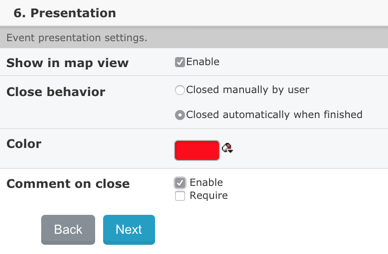 6.2 Select a Close behavior: Events can be closed automatically when they finish, or rather a user (typically an Operator) has to close them manually. 6.3 Select a Color: the color of the blinking icon on the map. Comment on close: defines if you want to input a comment when the event is manually closed. 6.5 Click on to finally Save your rule.